The Hammond brothers arrived from England in 1862, an early date for white settlement on the B.C. coast. The Cariboo gold rush of the late 1850s had brought a small influx of settlers to the Fraser Valley, and a few farms had been established on the Albion Flats in the future Maple Ridge; at New Westminster, the seat of colonial government, Her Majesty’s soldiers were still living in tents. By 1883, with the railroad’s arrival, the Hammonds prepared to subdivide their farm on the Fraser into urban plots and sell them. 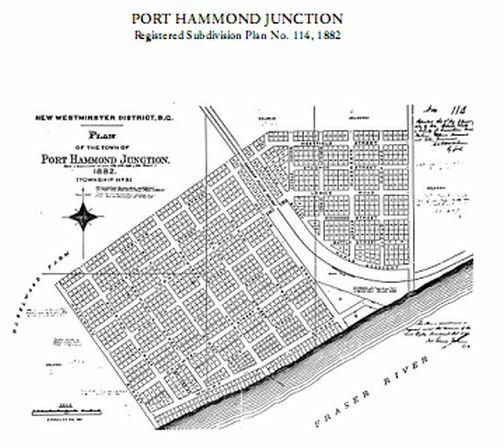 Their subdivision was registered as “Port Hammond Junction.” Development was slow until the early 1900s, when a mill was established next to the railway line. The Hammond Cedar Mill still dominates central Hammond, and is one of the largest private-sector employers in Maple Ridge. 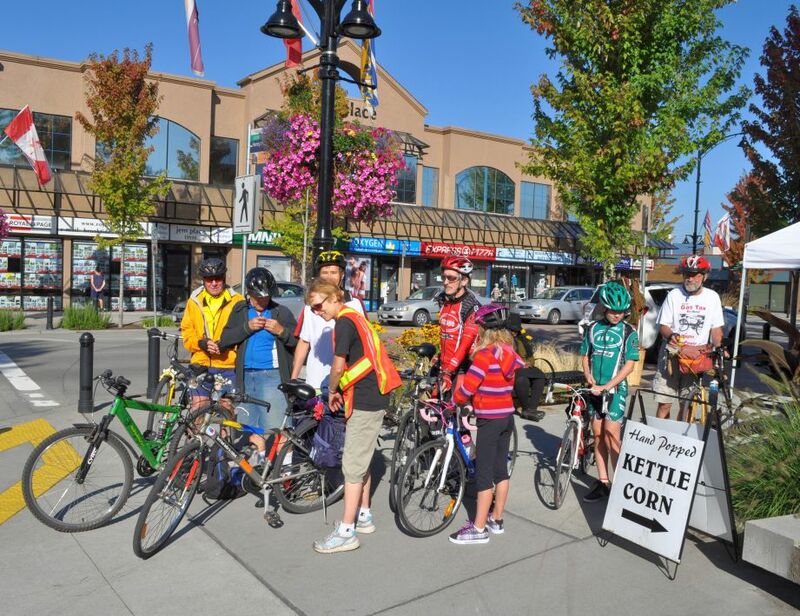 I visited Port Hammond recently as a tour leader at the invitation of Jackie Chow and the local branch of HUB (formerly the Greater Vancouver Cycling Coalition). My qualifications were slight; in a little book called Aesthetic Maple Ridge, my co-author Claus Andrup and I had pointed out Port Hammond’s potential. Since we published the book, the neighbourhood is seeing a revival thanks to the efforts of Leanne Koehn, Jennifer Zickerman and the Hammond Neighbours group. We began at the Central Memorial Park in Maple Ridge and looped over to Osprey Village in Pitt Meadows for coffee by the park. We rode into Hammond through Katzie First Nation territory, having checked with the Chief, passing under the Golden Ears Bridge and on to Wharf Street. This is where the port was located — a stepping-off point from the riverboats that carried passengers and freight before the roads were built. The small industries that grew up here needed river access, and so they’ve always blocked public access to the Fraser, as have industries and sections of rail track further east. 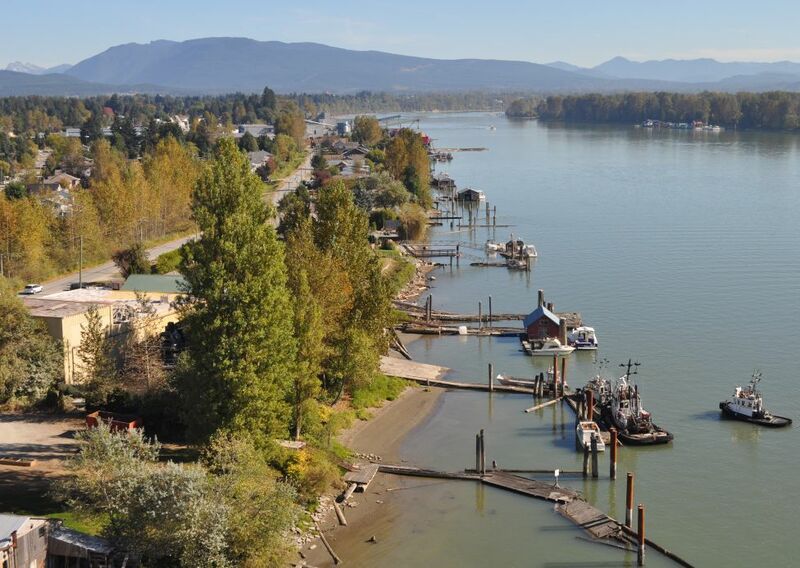 In all of Maple Ridge’s 20 kilometres of riverfront, only about two kilometres are open to the public, at Metro Vancouver’s Kanaka Creek Park, or at the small public wharf below the Billy Miner pub in Port Haney. 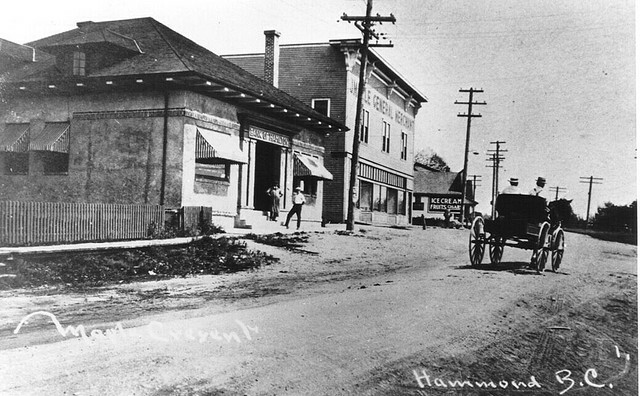 Port Hammond, like Maple Ridge in general, has lost much of its heritage architecture over time. This is partly because the old mill workers’ homes were impractically small by modern standards, and partly because wood structures tend to burn. But there’s also been a heavy dose of neglect by the market and local government. The District has never adopted a plan to recognize and protect Port Hammond’s character; the area was viewed simply as “the wrong side of the tracks” for many years. It’s surprising, perhaps, that the neighbourhood has held on as well as it has. 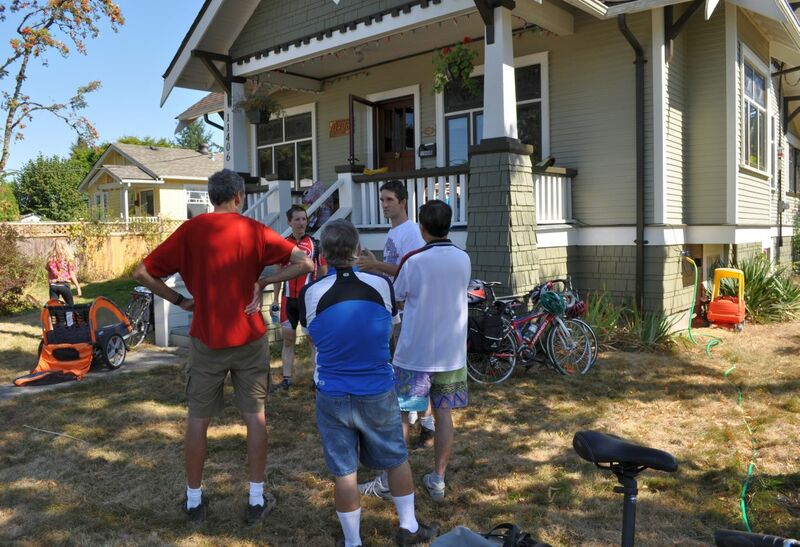 We rode up from the river past the cedar mill, looking at heritage homes (including John Hammond’s) and the main street before relaxing in the garden at the home of Leanne Koehn and her husband James Rowley. James spoke to us about the challenges they face in restoring their home, built by Leanne’s grandfather in 1923, as well as an adjacent house that is part of the same property. 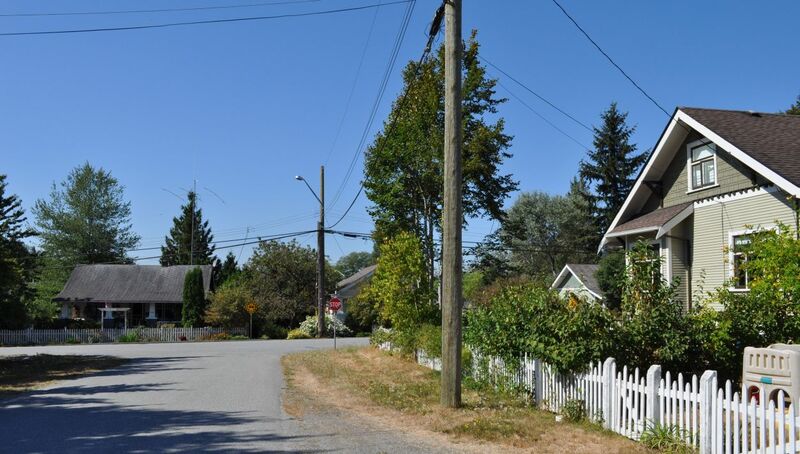 Early in 2012 they applied for a Heritage Revitalization Agreement with the District of Maple Ridge, an arrangement that would reduce their property taxes as an incentive to upgrade the old houses and make them more energy-efficient. Leanne wrote enthusiastically about the program at the time, but by September James was frustrated with the District’s list of expensive demands, which go beyond bringing all fixtures up to code: for example, burying all electric power lines (on the off-chance that the authorities might do the same some day) and constructing a public sidewalk along the street where none has existed before. 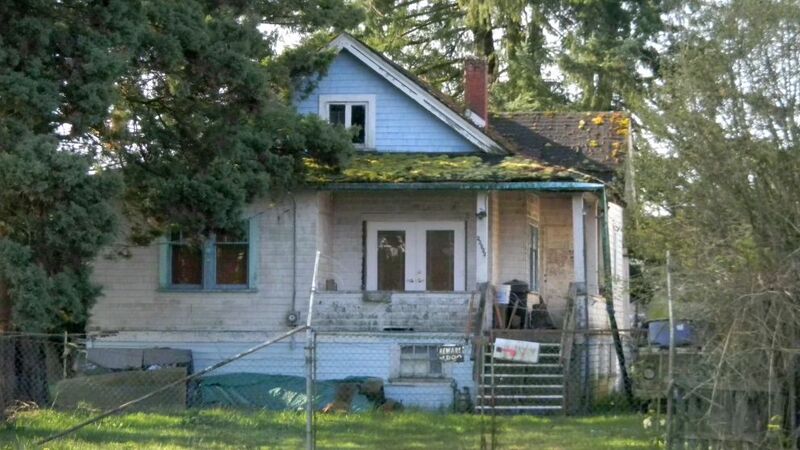 From this account, it seemed to me that local government’s store of regulations — each of which, no doubt, started as somebody’s bright idea — is likely to prevent, rather than encourage, the restoration of heritage homes in Maple Ridge. However, Leanne and James are energetic and resourceful people; we can hope that they and their neighbours can negotiate a reasonable compromise with the District.